With all the flair, determination and personality of an entrepreneur, Dr Tahir Akhtar, saw a gap in the market and quickly began filling that niche. In 2002 Dr Tahir decided that the time was ripe to promote business in Dubai. With a very successful career in the medical sector behind him Dr Tahir immediately took the ‘bull by the horns’ and incorporated Paralegal Services International which is the mother company for the other businesses owned and operated by Dr Tahir including DBA Business Advisors, PRO Serve and, the latest addition to the fold, Adam & Stroud. Dr Tahir’s energy and enthusiasm to provide a business solutions service in Dubai and the UAE to incomers and residents alike became the roots of this very strong and healthy company. 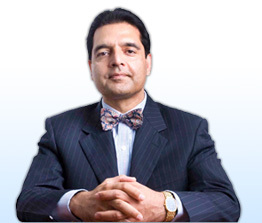 Dr Tahir’s personal values of trust, honesty, transparency and loyalty are an inherent part of the DBA Business Advisors’ community. Only consultants and other staff holding the same values are brought into the company. This sense of purpose and belonging to the DBA Business Advisors team ensures that teamwork is a valuable asset to DBA Business Advisors. Having worked to bring this excellent service to Dubai Dr Tahir is proud to be at the helm of this wonderful company. He feels his role is to ensure the successful growth of DBA Business Advisors and to ensure that all clients are treated with the respect they deserve. As mentioned earlier, Dr Tahir’s medical background is impressive and includes the following roles, mainly in the UK. Consultant Anaesthetist and Intensivist from King’s College London. Specialist in Cardiothoracic and Liver Transplant Anaesthesia and Intensive Care. Fellowship in Cardiac Transplant and Intensive Care Leads University, United Kingdom. As the Director of Intensive Care at the Queen Mary’s hospital I lead transformation of a high dependency facility to a modern six bed Intensive Care Unit. I instituted pulmonary artery catheterisation, haemofiltration and Percutaneous Tracheostomy as routine clinical practice. Riyadh Intensive Care Program was installed for better resource management and patient treatment. Daily APACHE & TISS scoring was started and computing equipment was acquired to implement this. Reports to the Trust Chief Executive and the local commissioners were produced to acquire funding for new monitoring, three intensivist and three resident trainees to staff the unit independently. Nursing staff was recruited from the neighbouring trusts. Intensive Care Nurse Manager was appointed. Two other intensivist were recruited in due course and an independent consultant intensivist on call rota was established. The unit was recognised by the intercollegiate board for intensive care medicine as a training unit for intensive care medicine. Funding for two ‘Research Fellows in Intensive Care’ was successfully acquired from the private sector. Research was carried out into the use of antioxidants in sepsis, new antibiotic for pneumonia, Splanchnic perfusion in patients undergoing major surgery etc. On my appointment as the Consultant Co-ordinator Regional Intensive Care I acquired funding from the Region to appoint a G Grade regional Audit Co-ordinator at Queen Mary’s hospital. Regional audit projects were carried out on Brain stem testing records ( also published in Anaesthesia), Transport of the critically ill patients and complications of Percutaneous tracheostomy. Reports of these audits were circulated to regions and verbal presentations made to various committees & organisations. I was an active member of the Clinical Governance Care Group of the Trust. I actively encouraged conception, data collection & implementation of audits in many hospital department. Co-organiser National meeting of the Society of Computing & Technology in Anaesthesia, Sidcup May 1999. Chaired a session on Intranet in SCATA meeting May 1999. Consultant Co-ordinator for Intensive Care Audit, South Thames 1996 - 1998.